2K Sports has announced the ‘Legends Showcase’ downloadable content will release on Tuesday November 29th for both the Xbox 360 and PS3. 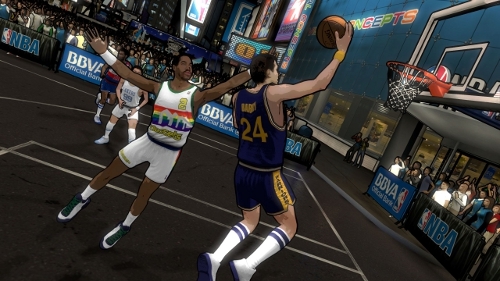 The DLC will go for $10 and features a cel-shaded art style with various “blacktop” modes and HORSE. It also will unlock the ability to edit historic team rosters offline as well as provide the opportunity to use the historic teams in online match-ups against others who have purchased the DLC. As documented over the build-up from its early discovery to the announcement and now its release the DLC is being delivered under just about the worst possible circumstances. Beyond even the league lockout severely damaging interest in the product is that the content of the DLC has been received poorly, which began with the pricing and first screenshots that displayed the art style, and recently amplified with the gameplay videos that prompted stunningly widespread negative response. Still, its a significant offering considering the work that went into it, and one that could be justified in value for some consumers.